Canon and Draw Brewing Co. makes its debut in the fan. … Plus seasoned skillets and ramen remix | Food and Drink | Style Weekly - Richmond, VA local news, arts, and events. Scott Elmquist Canon & Draw Brewing Co. had 11 beers available on tap during its inaugural weekend. A line snaked around the block at 11:45 a.m. Dozens of people filled the Main Street sidewalk in the Fan, anxiously waiting to get their hands on the city's newest local beers. As of noon on Saturday, Canon & Draw Brewing Co. is officially open for business. Owned by the same team that's behind Steam Bell Beer Works, Canon & Draw is sleek and sophisticated, with a minimalist interior and promising list of brews. Opening day libations included a classic American lager, a dry-hopped saison, a plum ginger gose, a hefeweizen, three India pale ales and a tropical stout. Over the course of the weekend there were also three special releases: an American barley wine, a spelt saison and a triple IPA. "Fans of IPAs will certainly see that style here," says co-owner Brittany Cooper. "But we do want to also keep to kind of what we did at Steam Bell, where we try to offer a lot of different varieties of style." It's a family business, and much like Steam Bell, Cooper says they wanted their second brewery to have a name that's meaningful to the family's history. Coopers were traditionally barrel-makers, and "canon" comes from the French word for "barrel." As for "draw," that comes from an old-fashioned tool used to make barrel staves. 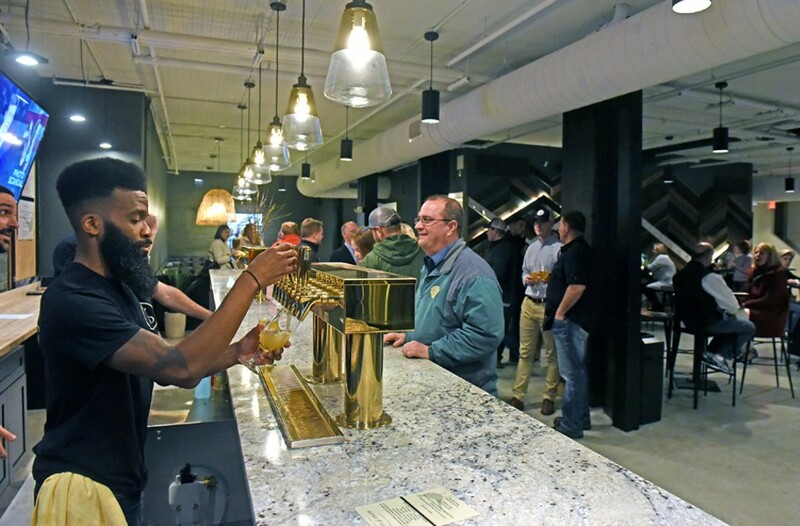 The new brewery, at 1529 W. Main St., is in that neighborhood sweet spot: walking distance for Virginia Commonwealth University students and slightly longer walking distance for other Fan dwellers. It's also nestled between Baja Bean, Foo Dog and Beauvine Burger Concept, which Cooper says is the perfect opportunity for collaboration. "We know how to make beer, and these guys know how to make great food," she says of the nearby restaurants. "They know how to run that business so much better than we ever will, and we wanted to come into the neighborhood and be a good partner to them." During Canon & Draw's inaugural weekend, servers from all three restaurants were on site, running around taking food orders. Cooper says that arrangement may be the norm for special events in the future, and on quieter days guests can order snacks off a limited menu from each spot. If you want more than small bites, though, Cooper encourages you to make more than one stop. "If you want to sit down and have a full meal, have a beer with us and then go to their business, sit down and really enjoy a meal," she says, echoing the oft-expressed sentiment that, at least around here, owners in the food and drink world look out for one another. Cooper says when she first entered Richmond's brewery scene, she was skeptical of that camaraderie. "Coming to Richmond I did not understand how this community worked in the way it did, with everybody helping each other out. I didn't trust it," says Cooper, who built her career in the more cutthroat environment of New York. "But generally these are folks who still believe in that old adage of a rising tide raises all ships, and it's really cool. I feel like we're still in that era of kindness here in Richmond, and I hope that stays." Need a refresher on how to use and properly care for that beautiful cast-iron skillet in your cabinet? This Saturday, the team at Belmont Butchery will show you the ins and outs of cooking with the indestructible pans. They'll do some demonstrations right there, and a selection of cast iron will be on hand if you've been thinking about investing in some new cookware. A woman from Southwest Virginia will be selling vintage pans that she's fixed up and seasoned. The event begins at 2 p.m. It's never the wrong season for ramen. So regardless of whether it's warmed up by next Monday, don't miss Kudzu's monthly ramen pop-up at Branch & Vine. The menu will include shiro butter-bean miso ramen, the kudzu cheese steak with kimchi and pimento cheese, and chasu-smothered tater tots. The pop-up begins at 5:30 p.m., and takeout won't be available, so plan on having a seat.